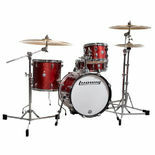 The Ludwig Breakbeats drum set, co-created by Ahmir “?uestlove” Thompson is the ideal drum set shell pack for the gigging, urban percussionist. 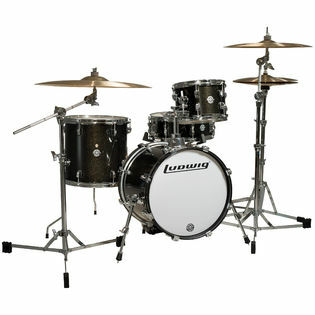 This 4-piece kit was designed to be “break-able” for a gritty, raw downbeat while being compact enough for an apartment, cab and a coffeehouse. 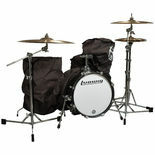 Positioned on an included lift for optimum reach, Breakbeat’s 16″×14″ bass drum, 13″×13″ floor tom, and 10″×7″ tom not only fit into tight places, but also break down quickly and easily. The driving force behind this shell pack is a 14″×5″ matching wood snare drum. The combination of this 16″ kick and 14″ snare produces the punchy, dry and “breakable” backbeat that is Questlove’s signature. This shell pack also includes velvet storage bags for a convenient transport option. Additionally, you can use the bags to reduce volume by draping each bag over each drum. Available in an Black or White Sparkle wrap, Breakbeats by Questlove has a footprint that is as original as the legend that created them. 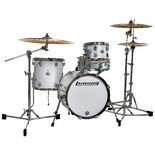 The smaller size makes this a great set when you have a lot of gigs and a small automobile. You might want to upgrade the drumheads, but the originals are still good. Steve Weiss Music was fast and efficient and I was happy they had the red sparkle color in stock.